President Donald Trump is stopping in the Midwest to highlight an industry that’s benefiting from his trade policies. The company credits Trump’s plan to impose tariffs on imported steel and aluminum for the move. The president also will stop in Peosta, Iowa, to tour a manufacturing lab and participate in a discussion on workforce development. There are large parts of the economy — technology companies, farmers and manufacturers — blaming Trump’s policies for job losses. Mnuchin says President Donald Trump and his European counterparts reached an “agreement in principle” to avoid an escalation in their trade dispute. 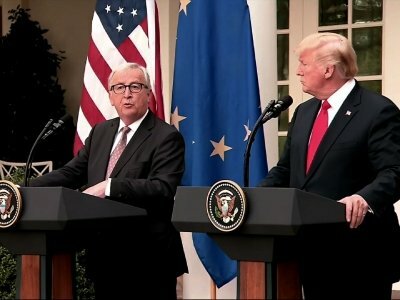 President Donald Trump and European Commission President Jean-Claude Juncker say they’ve agreed to work toward “zero tariffs” and “zero subsidies” on nonautomotive goods. Trump says the EU has agreed to buy “a lot of soybeans” and increase its imports of liquefied natural gas from the U.S. And the two sides have agreed to resolve a dispute over U.S. tariffs on steel and aluminum.